The JAS Shoulder system utilizes proven principles of Static Progressive Stretch (SPS) to achieve permanent restoration of joint ROM in three 30-minute sessions per day. The patient-controlled protocol allows for pain-free therapy, virtually eliminating muscle guarding and assuring excellent compliance. A recent study showed patients who used the JAS Shoulder device gained significantly greater ROM in both external rotation and elevation when treating adhesive capsulitis. 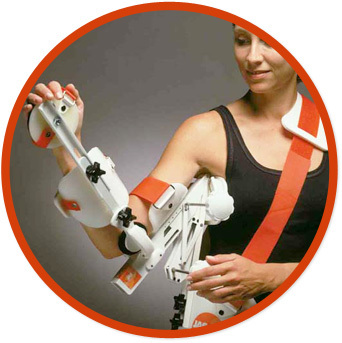 The JAS shoulder offers full range, multi-plane Range of Motion (ROM) therapy – 135⁰ abduction, 100⁰ external rotation, and 90⁰ internal rotation – now in a lightweight, portable, body – cuff design. An innovative scapular stabilization feature, combined with infinitely adjustable ROM, assures precise capsular stretch throughout the entire ROM. Maximal Total End Range Time (TERT) is achieved for optimal therapeutic benefit.